#stampinup I've said it before, but it bears repeating here: I hate to color. I'm just not satisfied with the results. But, I keep trying and sometimes I'm almost happy. Almost. The "Dove of Peace" stamp in the Holiday Mini catalog just calls out to be colored. So I listened and tried my hand at some coloring. I was inspired by Brian King's Blue Dove of Peace. I just loved these colors together! I thought this would be a good image to use with this week's Create with Connie and Mary sketch challenge. I started with a Lost Lagoon card base, added a Soft Sky mat that I embossed with the Softly Falling Embossing Folder, and then added a square of Mint Macaron. I stamped a sentiment from "Versatile Christmas" in Lost Lagoon onto this square. Then I tied on a length of the White Glitter Ribbon. I stamped my dove in Lost Lagoon onto Thick Whisper White Card Stock. I colored him with Marina Mist, Mint Macaron, Lost Lagoon, Wild Wasabi, and Soft Sky Stampin' Write Markers. Then I fussy cut him. 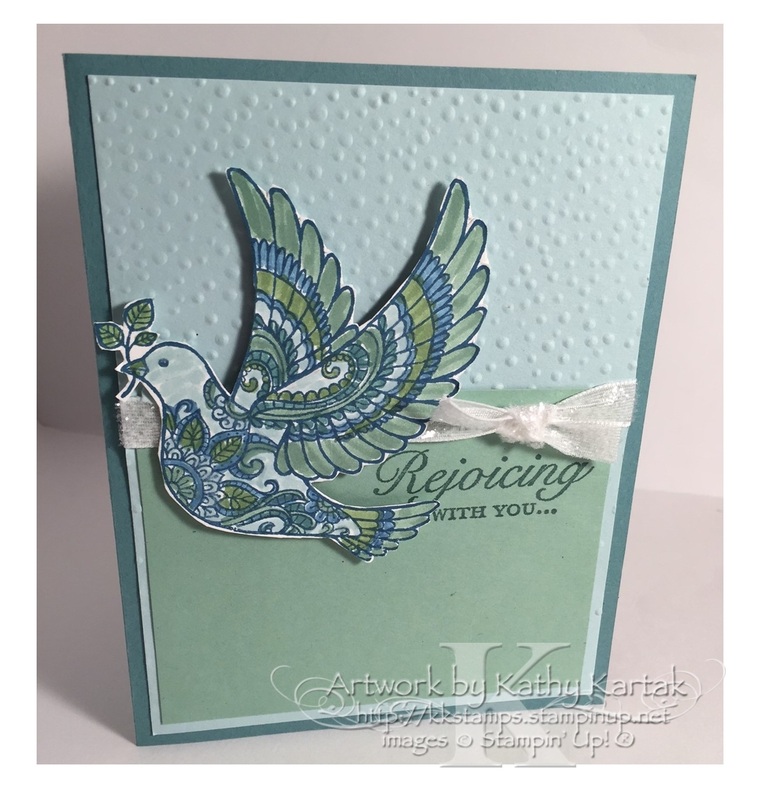 I adhered the dove to the card with Stampin' Dimensionals. If you don't look too closely, I think my coloring is okay satisfactory pretty good.